I think I coined the term, but the concept I picked up from Tom Conry in 1989. Conry suggested that every Scripture reading can be boiled down to one of two: the Creation or the Exodus. He’d have to stop by to explain that in detail, but the gist of the concept is that the human condition, the human relationship with God, is either about God’s creative, generative activity on our behalf, or about God saving our butts when we’ve screwed up. Let’s take funerals. There are three basic messages from which to choose. One can head in the direction of eulogy, finding a passage that reflects the deceased person in some way. Mary was devoted to the Eucharist? What about a gospel from the Bread of Life discourse, John 6? Mary was a devoted wife? Then Proverbs 31 is a good call. One can also get theological and seek passages that describe the Christian belief in resurrection, heaven, the after-life. Isaiah 25:6-9 (the Messianic banquet) or Romans 6:3-9 (Baptism into Christ’s death) fit the pattern here. The third consideration is to bypass the deceased and the theology and comfort the mourners. John 14:1-6 (I will go to prepare a place for you) or Matthew 10:25-31 (Come to me with your burdens). 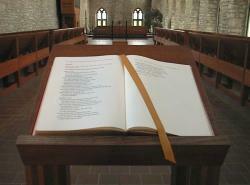 A priest or liturgist can be attuned to the mood of the family so as to facilitate the choice of readings. The mourners are not experts, but they do have pastoral needs which can be guided by funeral planners knowing which readings fit which profile. At the very least, one can cut down into thirds the broad categories of Scripture choices. I suspect this applies to music as much as Scripture. My sense is that the requested funeral repertoire leans heavily toward the third category: comforting the mourners. I think if we were to parse through the list of parish favorites, we would get a clue as to the general expectation people bring with them to singing liturgical music. If the songs are a bit detached emotionally as Ephrem might suggest, perhaps people aren’t looking for the deep love song/San Juan de la Cruz kind of spiritual intimacy. If the songs are less about theology, more about Christ, less about community, etc., that’s an analysis I’ll have to leave you to ponder for your own parish. My sense is that an ideal parish repertoire has some balance. And getting back to Scriptures, I hope your funeral and wedding planners have more than a one-trick pony up their sleeve, too. This entry was posted in Liturgy, Scripture. Bookmark the permalink. Parallel to this is that most Christian heresies and even mere spiritual weaknesses involve emphasizing one of Christ’s natures more than the other.